The 2015 season of MLS will feature a brand-new TV deal with broadcasters FOX Sports, ESPN and Univision Deportes combining forces to provide soccer fans with regularly scheduled games throughout the season. With new teams Orlando City and New York City FC on board, as well as new signings in the league including Kaka, Frank Lampard, Steven Gerrard and more, 2015 promises to be the most exciting season in the league’s history. Whether MLS can get a boost in the TV ratings department will depend largely on the production capabilities of ESPN, FOX Sports and Univision Deportes. The three broadcasters will need to play their A-game in order to produce coverage that will encourage viewers to keep coming back for more. 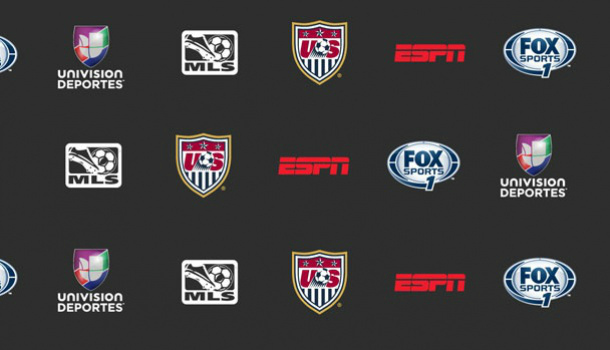 Bookmark the MLS TV schedule page today, which will be updated throughout the season. And if you haven’t done so already, start a free trial of Sling TV so you can watch the MLS games on ESPN and ESPN2 online (no cable or satellite TV subscription is required). John Strong will team up with Alexi Lalas to work together on many of FOX’s high-profile MLS matches. Strong will be FOX Sports’ lead commentator, while Lalas will be co-commentator. Grant Wahl will serve as a sideline reporter (quite why a sideline reporter is even necessary is a debate for another day). The trio will make their MLS debut for FOX Sports on Sunday, March 8 for the Seattle-New England game (9:30pm ET). The Strong, Lalas, Wahl trio will call most Sunday prime-time matches for FOX Sports. Earlier on Sunday, the FOX Sports trio of JP Dellacamera (commentator), Brad Friedel (co-commentator) and Julie Stewart-Binks (sideline reporter) will announce the Sporting Kansas City against New York Red Bulls game beginning at 7pm ET. As we reported in October, Friedel will become a regular member of FOX Sports 1’s MLS game coverage once his season with Spurs ends later this year. Rob Stone hosts FOX Sports 1’s season-opening pregame, halftime and postgame coverage with Eric Wynalda, Stuart Holden and guest analyst Landon Donovan. All MLS games televised by FOX Sports 1 and FOX Sports 2 are simulcast on Spanish language network, FOX Deportes, and streamed on FOX Sports GO in Spanish. FOX Deportes’ lead broadcast team features a three-man booth with play-by-play announcer John Laguna and analysis from Mariano Trujillo and Claudio Suarez, both former MLS players. All matches on FOX Sports 1 and FOX Sports 2 are available to customers of participating pay-TV providers via the FOX Sports GO and FOX Soccer 2Go apps, and on the web through FOXSportsGO.com. FOX Sports’ MLS schedule, which runs from March through October, consists of 34 matches, with 33 games scheduled for FOX Sports 1, one on FOX Sports 2, and most kicking off in prime time at 7:00 PM ET on Sunday evenings. Last May, FOX Sports 1 reached an eight-year TV rights agreement with MLS, marking the league’s return to FOX Sports in 2015 after a four-year absence. It’s about damn time they used the SAP mode for the matches on the Spanish stations for you know the predominant language in this country. But how often would an English speaker watch a specific game that is broadcasted in Spanish? When it’s the only way to watch a nationally broadcast sporting event of an American/Canadian league. As you can see above Fox and ESPN have a Spanish language broadcast for their games and I believe ESPN did in the previous TV deal and NBC did as well, but Univision has never offered English. When Univision had the Sunday night game on one of their crap SD channels like Galavision it was blacked out on MLS Live because it was a national broadcast,so you couldn’t even pick the one of the local feeds that was in English. Thanks for this update. Strong and Lalas could have the makings of a solid commentating team as is Healey and Twellman. Surprised to see Stuart Holden joined Fox, just saw him last week on ESPN FC. I agree that a consistent broadcast schedule and coverage of MLS games will benefit the growth and popularity of the league. Looking forward to the season. Top notch job here Chris. You made it exciting to read and all ready to start the MLS season. Really wish one of the networks would run a Match of the Day style show on Sunday night. It’s so hard to see the highlights of other teams even when you try. I did but on DirecTV. The English commentary was pretty meh and they actually talked over the national anthem. SAP worked and the game coverage was good except if you where a Chicago fan.